Travel a mile or so beyond the borders of Preston and you're in agricultural land and the soil is good. To the south west is the West Lancashire Plain a flat area with rich soil between the Ribble and Mersey, loads of veg and market gardens. 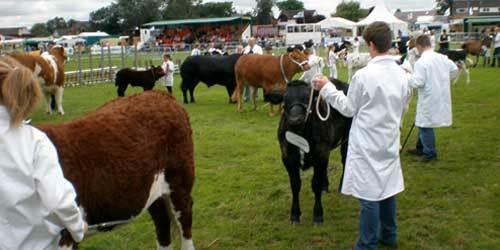 To the north west is another flat area, the Fylde for cattle, sheep and more veg. To the east are the hills and valleys of the Pennines, Bowland Forest and Ribble Valley all prime agriculture for mainly cattle - hence Lancashire cheese. Sheep as well. Lovely mellow, green area. Also in the Ribble Estuary are shrimps, Morecambe Bay; cockles. Fish was once a major activity in Fleetwood but not any more. Then there are local specialities which tend to be heartwarming working mans fare like the Lancashire Hot Pot and Chorley Cakes. Returning from a spell in a hot sandy place the green of England became visible from the plane, seemed unreal, how could it be so beautifully green. Booths is a quality supermarket headquartered in Preston. Jobs for local people and selling local produce. It also has an excellent range of beers and wines at decent prices. 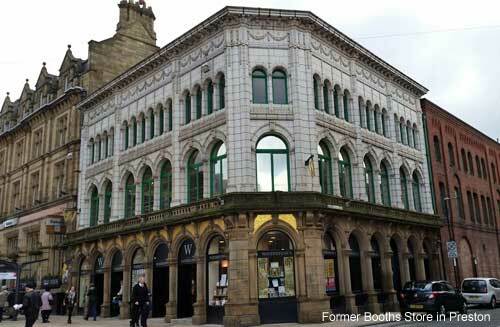 Once there was a big store with a cafe in Preston where Waterstones is now. The bridge over Glovers Court is a remnant of that store. Now there are stores in Fulwood and Lane Ends, and a big one in Penwortham just off the arterial route. 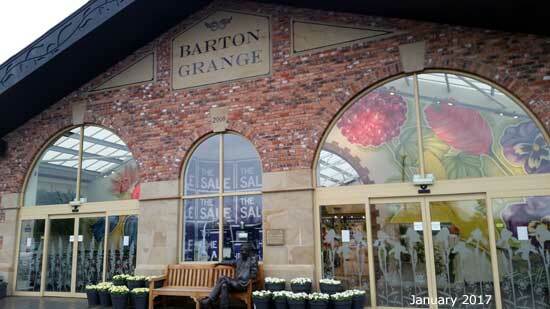 There are modern stores in Lytham, St Annes, Poulton Le Fylde and Garstang. 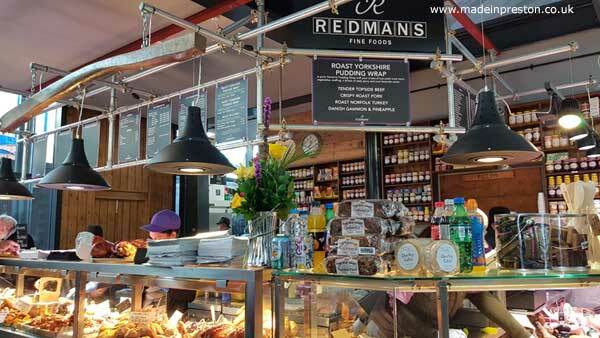 In Lytham it is combined with smart eatery, art gallery and Stringers Homelife. Not too far from Lytham centre. The gallery mainly features paintings by Richard Ansdell an artist who set up for a time in Lytham, making a big impression, and had the district called Ansdell named after him. One of the paintings was presented by the Booth family, they are mainly owned by Fylde Borough Council. Edwin Henry Booth was born in Bury and moved to Preston, aged 15, to work at a grocers. He had a very poor childhood with little education but worked hard and at the age of 19, in 1847, persuaded his employer to lend him money to sell vegetables in Blackpool. This started the company so it is 160yrs old. The main store and HQ used to be where Waterstones is on Fishergate. Upstairs was a prim cafe with waitresses dressed in aprons, from recollection. A lot of the above has come from the label of Booths 160th Anniversary Ale bottle, brewed by Daleside Brewery, Harrogate. Edwin worked hard and was obviously a smart lad, can you do that? 'Booths also specialise in blending fine tea. Before opening the first Booths store, The China House, Blackpool in 1847, Edwin Henry Booth trained as a tea trader where he developed the finely honed skill of expert tea tasting. This skill has been passed down from generation to generation to ensure all Booths teas are blended to match your highest expectations.' Copied from the back of a packet of Booths tea. 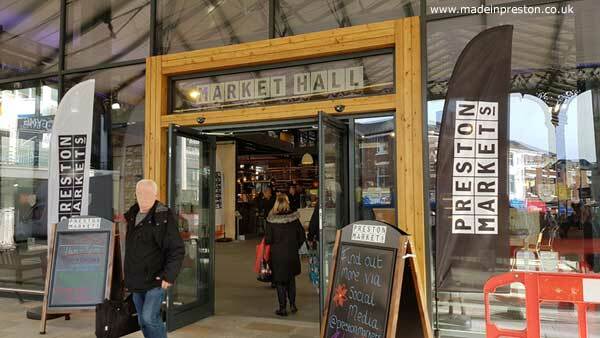 Preston has a new indoor market for food under the largest of the two Grade II listed Victorian covered canopies. They have a Facebook page. The new market is a clever and smart modern design. Inside are several food stalls, at the time of writing some are still being fitted out. Below are some photos. 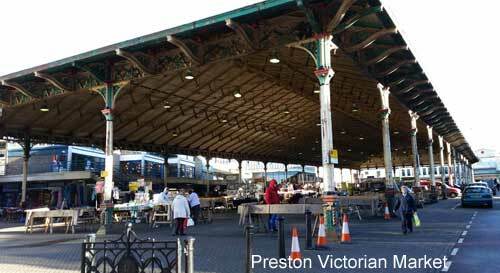 The Preston Victorian Covered Market, the largest canopy before modification, see above, and behind it the about to close indoor food market. 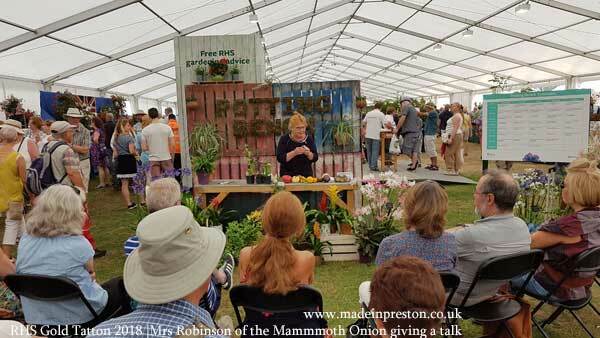 Mr Alan 'growing with nature' Schofield making one of his many points about organic growing. Alan is a great guy who has a mission. In 2008 the weather and economics are turning against him so join his box scheme. It's 2010 and he's starting organic vegetable growing classes on Saturday morning. We went and learnt a lot. 2011 you can rent accommodation. 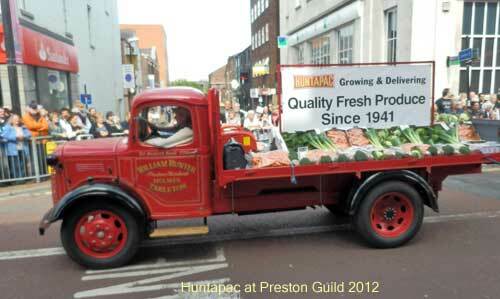 2013 and he's still delivering great veg. In 2015 he's stepped up the offer with a full box scheme where you select your items and order on-line. 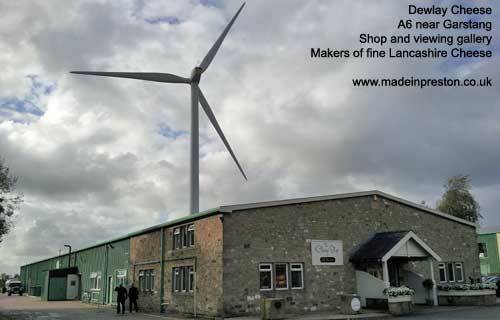 We visited their shop, exhibition and viewing platform. 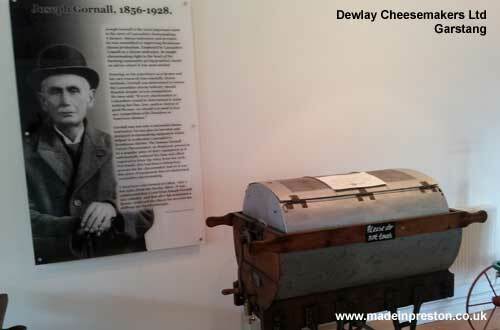 Makers of all kinds of cheeses in a well kept, modern factory on the A6 near Garstang. Worth a visit, you can spot the windmill just beyond Barton Grange. 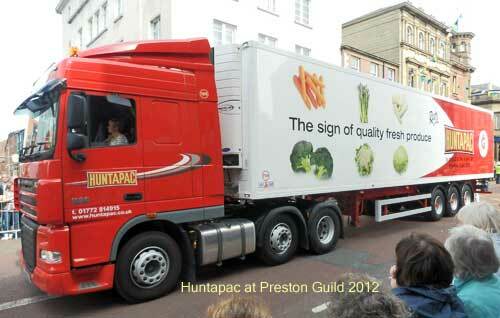 Situated on the fertile Lancashire plains between Preston and Southport, Huntapac is a family business founded in 1942 and serving many of the UK's supermarkets. 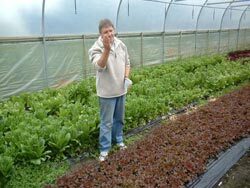 Growing and packing from seed to shelf root vegetables, brassicas, salads and organic vegetables. Their vehicles look smart and they did a good turn out at Preston Guild. 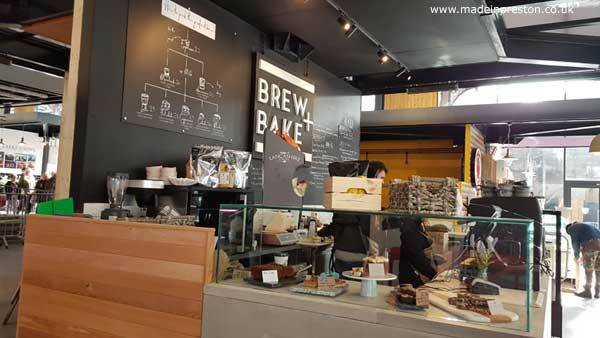 Nice very small cafe with pleasant atmosphere, good light meals and cakes all home made. Very friendly owner once owned a cafe in Cannon Street in Preston. The Blackcurrent pie is legendary, crisp pastry on top, no pastry underneath and loads of blackcurrents. The bacon barms are excellent as well, sometimes you find a place where the bacon is really good quality and bun is just right and this is it. Read more on their website. Next to Bilsborrow on the A6 and enter at the only roundabout for miles. We are regulars at Barton Grange. The Willows Restaurant and Riverside Cafe are both great for a big eat or a snack. 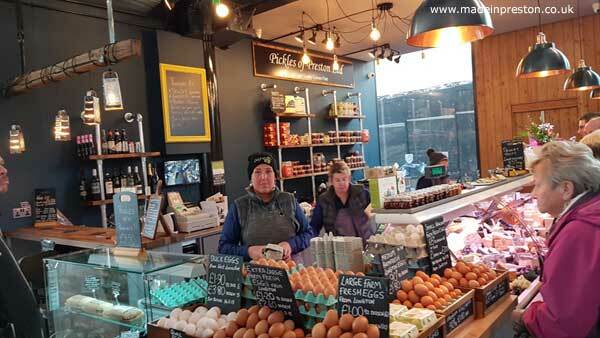 The farm shop is superb. 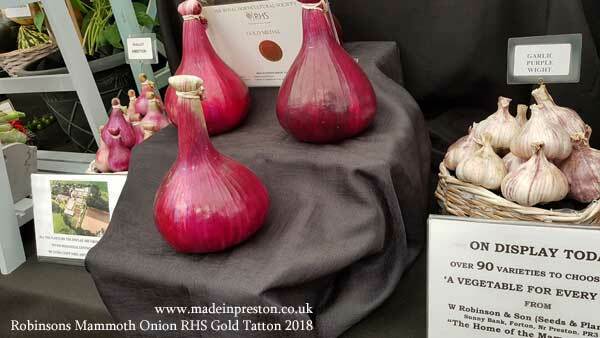 The kitchenware range is probably the best in Lancashire and everything for the garden. Soon they'll open a ten pin bowling and faster food place just across from the garden centre. There's also a marina on the Lancaster Canal and a large poultry farm containing a wide range of hens. They also have a room where exhibitions and talks take place. Very big car park superbly maintained and set out. August 2018 the new Flower Bowl Entertainment Centre opens at Barton Grange including restaurants, 3 screen cinema, curling, golf simulator, bowls and very smart inside and out. The exterior has a grass roof said to house sheep at some stage. 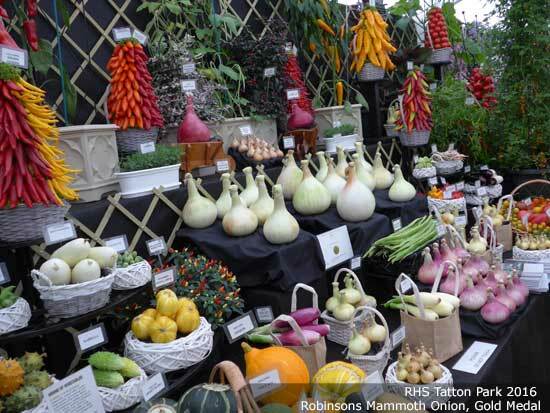 Suppliers of seeds, specialist growers and medal winners at RHS Tatton and other major shows. 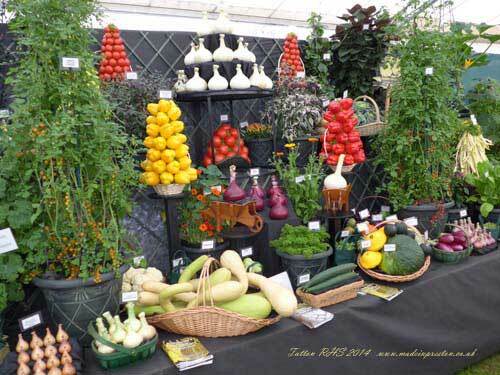 We like to buy our seedlings from here but they have limited opening hours due to their show work so check. 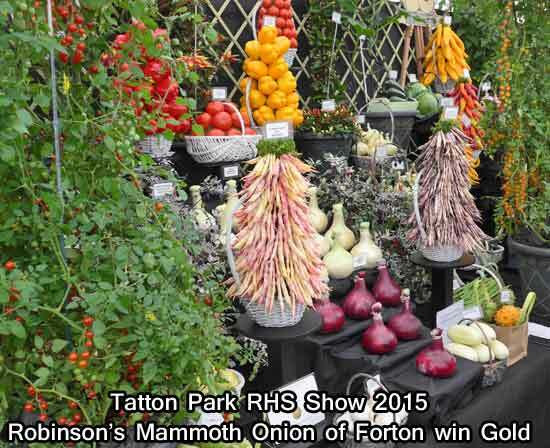 See the full 2015 Tatton Park RHS Show Page. 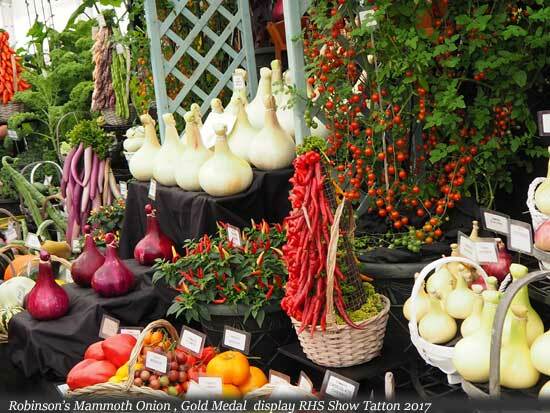 After winning a Gold for 3 years running the Silver Gilt is an anti-climax but still a great result considering the 28 degree heat of this year and wide range of vegetables needing to be kept in prime condition. 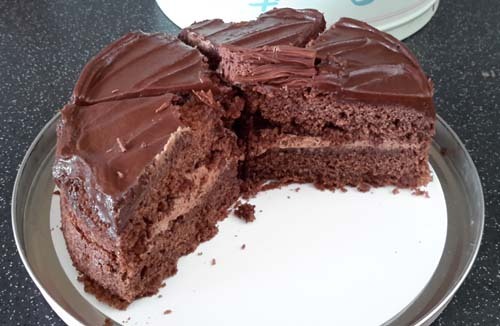 Lathams is a family business started by Gwen Latham over thirty years ago, producing an extensive range of high quality indulgent desserts, cakes and biscuits. They supply many reputable restaurants and eating establishments in and around Lancashire and South Cumbria from their purpose built "state of the art" bakery production facility in Preston. There are also two retail outlets in Caxton Road, Fulwood and the other just south of Preston at Hutton. The cakes are sold at Barton Grange Farm Shop which only sells the best and that is where we first found them. Still there in March 2015. Also sold at Booths. 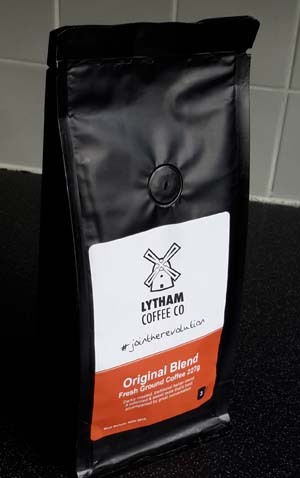 A love of coffee naturally drove their desire to develop their own coffee, their own blends, their own brand of coffee. Available in many stores in the area. To quote from their website. A family run company based in Preston, Lancashire. Who pride themselves in being an innovative vegan health nutrition brand created through years of experience, passion and dedication in the Food, Nutrition & Beverage industry. The mission at NutreeLife is to make good nutrition accessible for all. To challenge the perception that protein is just for body-building, but more for the everyday; those who want to be healthy, those who lead an active lifestyle, or those who just simply want to up their protein intake. Their ethos is quality, and that is the foundation to everything they do. 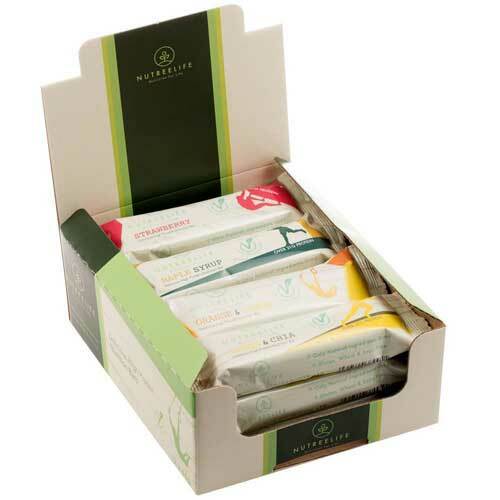 Only using the finest natural plant-based ingredients to create a range both highly nutritious and beneficial for you. On the A59, good link from the M6. This is a nice place with interesting shops, decent cafe and delicattessen. We thought the car park a bit tight. Following a successful Dragons Den show, by Kirsty Henshaw of Preston, on the 14th July 2010 the Worthenshaws Iced Dessert was given national exposure. Dragons Gordon Ballantyne and Peter Jones came on board. It was later decided to re-brand the product and it is now Kirsty's. Mainly everyday meals and gluten free. We don't know where the products are made but Kirsty is from Preston. We were recommended to go to a shop called J.L.Bean on Victoria Road in Cleveleys for a pie. This was good advice, apparantly if you live there it's a legend, and it was very good. Meat and Potato, nicely spiced bit like a good Melton pie. 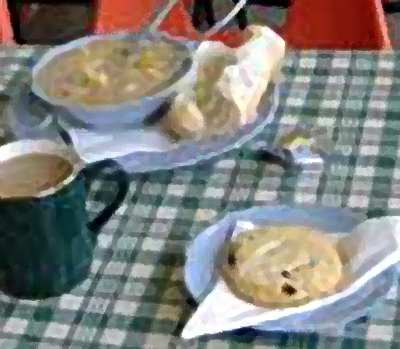 Wide choice of locally made pies, piping hot; potato and onion for example. Lots of cakes and things as well including your big occasion cake. (2014 update. We haven't been for several years assume it's still there). 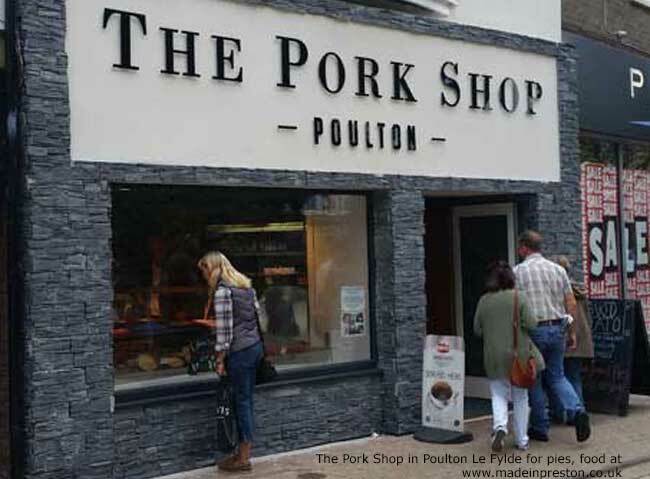 There is a pie shop called the Pork Shop in Poulton Le Fylde that has a big range of hot pies and attracts long queues, it's a phenomenon. Lancashire cheese is said to have developed from Cheshire cheese. It is more difficult to make than a lot of cheeses as it uses curd of different ages to give it a crumbly texture and more tang in the taste. There are several types; creamy, mild, young, sharp, aged and acid. I always thought crumbly was the genuine Lancashire but apparantly its a relatively new version and now I know, a well matured is favourite though my wife likes it milder. Creamy doesn't crumble and is said to be perfect , ideal in some opinion, for melting and use as toasted cheese. Walks to taste different cheeses have been prepared and are about 6 miles long. There are 3 leaflets. 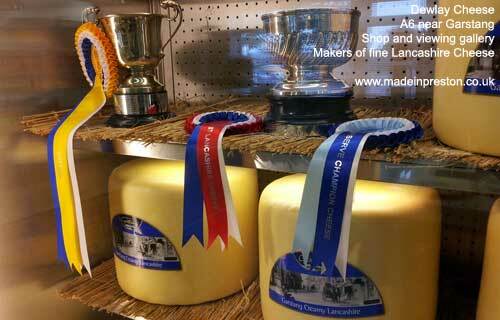 I picked one up for tasty Lancashire cheeses at Garstang Tourist Information. My own comment is that these walks are likely to be in dairy areas and after being chased by bullocks at Malham Cove in 2006 I've never liked going into cattle fields. So we'll stick to the roads. A flat round cake best with thin pastry. Any left over pastry can be made into a Chorley cake by putting currents and / or raisins on top and placing another piece over them and flattening it a bit. Put into the oven on a tray with the quiche or whatever you made the pastry for. Best with butter on but great without when fresh from the oven. Best a foot wide as well. Some call it 'dead fly pie'. Chorley is a small town south of Preston. I used to live not too far away but never went there for some reason. A recollection is that some Chorleyians called it Charley and some would travel by buzz. 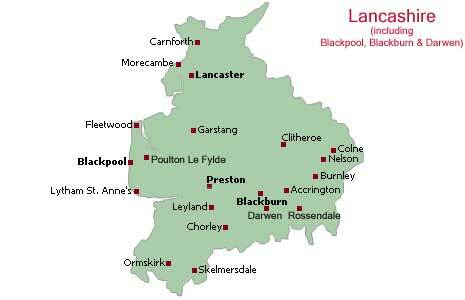 You can travel 3 miles in Lancashire and everyone knows where you're from, often anyway. A puff pastry version of a Chorley cake covered in sugar. Usually not as flat, as the fruit is free standing in the middle and usually not as wide, say 3 to 4 inches wide and three-quarters inch high. A plain bun for making sandwiches. Many people, outsiders, don't know what you mean if you ask for a 'barm', so just do it. A small richish pastry type cake, about 4 inches diameter and half an inch high containing coriandor or caraway seeds and covered in caster sugar. Although I only vaguely remember. Goosnargh is a village / suburb north east of Preston. Sounds a bit Nordic. A mixture of potatoes, meat and veg with some juice / gravy (thin liquid of some kind, I'm not a chef) sometimes with a pastry top. Veg done nicely so its soft but not too soft. Usually in a pot bowl from the oven. A potato pie with no meat in it for eating on non-meat days such as Friday. Preston having a large Roman Catholic population. 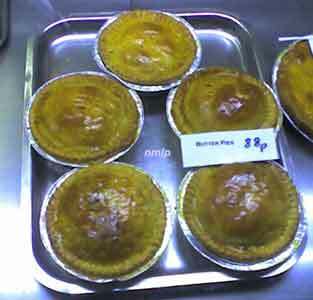 Someone told me they used to call them Catholic pies although I've never heard the expression used. A gathering of Butter Pies photographed as found on 11th February 2009 near Preston. As it was close to St Valentines Day I bought one for my wife, but she's not keen so I ate it. Grand as anything. Wonder how long those gorgeous things lasted although I must admit to prefering a meat and potato. Even the minute piece of meat seems to add something far out of proportion to its size. Boxed chocolate made in Preston. Booths sell it. Beech's page. A sign, the home of Rocky Bars, (or words to that effect) is on the wall of the Kirkham factory facing the railway the line. Fox's originally, 1853, from Batley bought the factory in 1966 from Parkinsons Biscuits. In the mid-70's Northern Foods bought Fox's. 500 people work at the Kirkham factory which is one of three Northern Foods Biscuit factories. It was originally the Phoenix Cotton Mill and in 1957 Parkinsons Biscuits bought it. Parkinsons also had a factory in Crown Street, Preston. (I thought it was near the docks. There was a fire in 1960ish that burnt it down, need to check, if anyone can add anything, please let me know). We used to get broken Parkinsons biscuits as my mother worked an occasional evening shift there. Rock for every occasion. Hard, brittle sticks of sugary toffee that soften nicely in your mouth and sometimes if they're a bit old they aren't hard - it never bothered me whether they were hard or soft. To have that amount of toffee was all that was necessary. A standard stick is about a foot long, just over an inch diameter, red on the outside, white on the inside with Blackpool written in red right throught the stick, wrapped in sellophane. If you go to Blackpool and come home without one, you havn't been and are a miserable type. Dr Oetker Large employer in Leyland for Chicago Town Pizza, formerly Schwan Food Company but bought out in March 2009. Tablet size losenge - hot. Made in Fleetwood in a little factory owned by the Lofthouses, Fishermans Friend. Fleetwood was once a major fishing port and these losenges would have been just what you need far out at sea on a cold night. Although those guys were tough bobbing about in wild seas to bring home your tea. Fleetwood is now known for its market and Freeport Outlet. The Lofthouses are local legends and sponsor all kinds of good causes. Very hard, oval sweet, clear brown - hot. Still made in a little factory in the middle of Wigan, Uncle Joes. You know you're near from the smell. Those Wigan miners were tough as well, people don't know they're born nowadays :-). Every day in Liverpool someone is eating scouse. I've only eaten it once and it was at Speke Hall in their cafe. It's a sort of hotpot, sometimes called blind if there's no meat in it. The one at Speke had a lot of meat in it, but that's the National Trust for you. Those Liverpool dockers were tough as well, people don't know they're born nowadays :-). Burtons Biscuits - Blackpool. Spreading the smell of baking biscuits to a wide area of Blackpool. Quite good if you experience it. My grandfather used to make this for when I arrived. A big tray of Everton Toffee made with syrup broken up with a small hammer, that was my job. It was good but my teeth suffered. The closest now to that is Thorntons Special Toffee. That's good as well. North	of	Preston. They	have	a	garden	centre	and	there	is a cafe. There are	others	nearby as well as Guys Thatched Hamlet and Eating Establishment next to the canal. A tart with jam and custard sprinkled with coconut. Some say bananas can be used instead of jam. If it's an old recipe bananas and coconuts don't seem that likely, but maybe. When I was at school we got it a lot. It was good stuff. Everyone knows the sweet, strong mint, cold on the tongue, hot in the stomach of Kendal Mint Cake. There are a couple of manufacturers in Kendal - Quiggins and Romneys. There is the sweet white version and the less sweet brown version. A chocolate covered version is now available - this is like a large crunchy After Eight mint and is a very worthwhile experience. Next to the church where Wordsworths grave lies is a small building, a cottage, where the smell of cooking Grasmere Gingerbread emerges. It's really good, large slabs of square gingerbread individually wrapped. Take some home if your car can take the weight, eat it immediately if not and walk around a bit. I'd recommend Baldry's cafe in the centre and a wander into the Heaton Cooper Gallery, to let the gingerbread digest a bit before travelling or you'll be asleep. 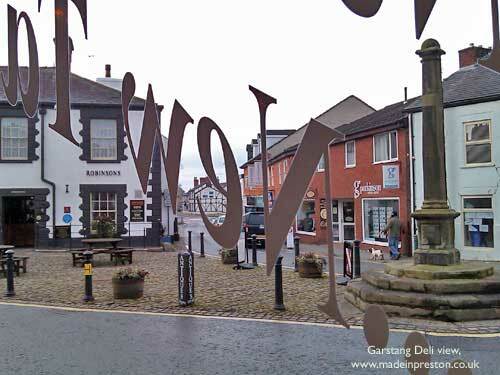 In the middle of Hawkshead is a shop selling locally made, broad range of excellent relishes, jams, chutneys etc. The Hawkshead Relish Company. 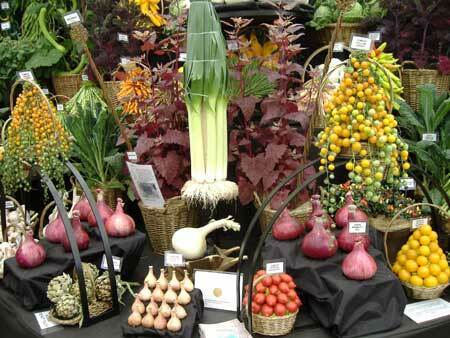 Their produce can be bought in many shops in the North West and probably elsewhere. I bought a hot chutney in Windermere and it cost quite a bit but it helped the local economy in an off-peak time. The shop in Hawkshead is in an old white house in the square, they're all old and white and seem to be arranged round squares, so that's not much help. That all this is in the beautiful country so close by makes us very fortunate.